The Museum commissioned Dominican-born, Allentown-based artist Rigo Peralta to create the first-ever mural in the vestibule at the entrance to the Museum. 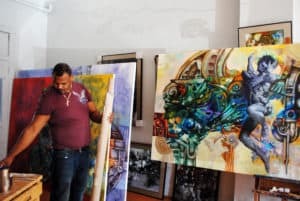 Incorporating imagery from Taino and Mayan architecture and building on the tradition of heroic figures in mural painting, Peralta’s work addresses both personal and regional identity and history. The dynamism of his human forms belies their subservience to technology, as they meld into an industrial tableau of gears and cogs. The composition incorporates the development of forms emerging organically through the application of layers of paint washes and bursts with a palette of color inspired by the landscape of Peralta’s birthplace. Transcultural is a tribute to our unique community, its melding of elements from various cultures paralleling our interconnectedness. This exhibition is presented through the generosity of the Audrey and Bernard Berman Family Fund and the Leon C. and June W. Holt Endowment.